I grew some tomatillos this year in the garden and I am just getting around to using them. I made some delicious soup with some of them. Next I'm going to make something actually Mexican! Peel the papery shells off the tomatillos and rinse them just to make sure all the dirt is off. Slice them in half and set them in a bowl. Drizzle a tablespoon of olive oil over the tomatillos and toss them lightly in the oil to coat them. Place them on a baking sheet, cut side up, and sprinkle liberally with pepper. Roast in the oven for 20 - 30 mins or until they are tender. Meanwhile, peel and chop the onion and garlic and heat the oil in a saucepan. Add the onion and garlic and saute over medium heat until the onion is soft and translucent. Pour in about half of the whiskey and cook, stirring constantly, until the liquid is gone, then add the rest of the whiskey and cook again until the liquid is gone. When the tomatillos come out of the oven, let them cool a bit, then add them to the saucepan blitz using a hand blender puree till smooth. 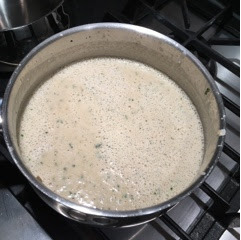 Add in the cumin and red pepper flakes along with the evaporated milk and coriander and blend until the coriander is chopped into little bits. Warm the soup and serve.